Cover of Kelly Brown’s book on Florence Lawrence, Hollywood’s first movie star. 2007 paperback edition. The movie industry of the early 1900s, during the silent film era, was not the star-centered commercial enterprise it is today. Most actors, in fact, labored in obscurity. And film makers liked it that way. But during the early1900s, the seeds of change were being sown, as a few actors tried some self-promotion in the trade press, and film exchange owners were also beginning to see that audience familiarity with actors was good for business. Still, one of the most popular actresses of that day was Florence Lawrence of the Biograph Studios. But Lawrence was not known to movie fans by her real name. A Canadian in her twenties, Lawrence had already made 38 films for the Vitagraph Co. before coming to Biograph. But even at Biograph, though her face was well known, she was simply known to the public as “The Biograph Girl.” Then came a film producer named Carl Laemmle. Laemmle, born into a Jewish family in 1860s Germany, had come to the U.S. when he was 17. He opened a Chicago nickelodeon some years later, and moved into film distribution in the Midwest. By 1909, after fighting with inventor and film-maker businessman Thomas Edison over film distribution rights, he established his own film production company, the Independent Motion Picture Company of America, also known as IMP. “Biograph Girl” Florence Lawrence, meanwhile, had a falling out with her employer, and Laemmle hired her to his company. Laemmle then went about creating some first-of-a kind publicity to introduce her. Copy of ad on the 'Florence Lawrence incident,' which mentions IMP's new film. Although there are some variations of the story, plus a degree of myth-making added over the years, the gist of what happened appears to be roughly along the lines that follow. In February 1910, Laemmle planted a fictitious news story that the actress had been killed in a street-car accident. Newspapers and magazines were the only real “media” then, and key to spreading a story of the kind Laemmle had created. After Laemmle gained press attention for his false story, he then placed ads in newspapers and the movie trade press that the story about Lawrence’s death was, in fact, a lie. In the March 12, 1910 edition of Moving Picture World, a full-page announcement appeared explaining that Biograph — angry over losing its “Biograph girl,” Lawrence, to Laemmle — had created the false story. This announcement also included a small photo of Lawrence and explained, by the way, that she was making a new movie for Laemmle’s IMP called, The Broken Oath, and that “very shortly, some of the best work of her career” would be released (in the ad, the film’s title was misspelled as “The Broken Bath”). Carl Laemmle, founder of the IMP film company, staged the Florence Lawrence event, making her America's first 'film star'. …A mere two months after Lawrence’s live appearance in St. Louis, Moving Picture World’s “Man About Town” [magazine column] professed astonishment at “the interest the public has taken in the personality of many of the picture players.” Letters allegedly poured into the offices of film manufacturers and exchanges, from both men and woman, asking for autographed photos of their favorite leading actors. One actress [Florence Turner] claimed to have received three thousand offers of marriage just three months after the Lawrence incident. By the end of 1910, Moving Picture World’s “Picture Personalities” column profiled Florence Turner of Vitagraph, Mary Pickford of Biograph, and Pearl White of the Powers film manufacturing company. Even if it did not invent the film star, the Lawrence incident signaled to the industry that the star had arrived. Mary Pickford, who followed Florence Lawrence as the ‘Biograph Girl,’ soon became a giant star with Adolph Zukor. Zukor soon found himself running a business that sought to bring noted stage and Vaudeville actors to the screen, one of whom was a child actress named Mary Pickford. By 1915 Pickford was on a salary of $10,000 a week — a huge amount at the time — and her drawing power became the foundation of the evolving Zukor empire which, after a series of business deals, became Paramount Pictures with Zukor as president. At Paramount, Zukor revolutionized the film industry by organizing production, distribution, and exhibition within a single company. But it was the movie stars like Pickford and others who became the collateral on which the film companies could borrow huge sums of money. Another film maker who helped push the early star system forward in the 1910s was William Fox. A German-Jewish immigrant like Carl Laemmle, Fox had made a fortune in the film exchange business. By 1915, he went into film production as head of the Fox Film Corporation. But Fox needed a star, and his solution was simply to create one. 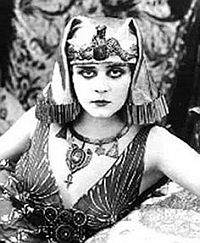 Fox transformed a somewhat “plain Jane” stage actress named Theodosia de Coppet (Goodman), into the screen’s first ‘vamp’ and million-dollar star, Theda Bara. His early movies with Bara, such as A Fool There Was (1915), produced the funds to help found the Fox Film Corporation, while others with Bara like Cleopatra (1917) helped make Fox a successful studio. Clara Bow, 1921, among the early film stars signed by Paramount’s Adolph Zukor, an early booster of Hollywood’s ‘star system’. Carl Laemmle was on the rise by then too, becoming a partner in 1912 in the Universal Film Manufacturing Company. Known later as simply Universal or Univeral Studios, Laemmle would eventually become its sole owner. In March 1915, Laemmle, amid much publicity, opened his new Universal City studios on the north side of the Hollywood Hills. Built on some 230 acres of farmland, it was world’s largest motion picture production facility. Hollywood was now the place where more and more films were being made, shifting from its former New York and New Jersey base. In 1915 alone, over 250 pictures poured out of the Laemmle’s Universal City studios, most of them two-reelers and serials. Adolph Zukor at Paramount, meanwhile, developed many of the leading early film stars. In addition to Mary Pickford, Zukor would also sign Douglas Fairbanks, Gloria Swanson, Rudolph Valentino, Clara Bow, and Wallace Reid. With so many “famous players,” Zukor’s Paramount was able to introduce block booking, which meant that an exhibitor who wanted a particular star’s films had to buy a year’s worth of other Paramount productions. It was this system that gave Paramount a leading position in the 1920s and 1930s. It also later led the government to pursue the company on anti-trust grounds. In any case, it was the early star system that helped build the Hollywood studios into the business giants they would become. “The Famous Players were now more important than the Famous Plays,” film historian Robin Cross would later say of the changing film industry in the 1910s. Celebrity culture was on its way, now given a much larger reach in those early days of film promotion. But celebrity culture would go well beyond film, becoming a powerful force in its own right and a key part of entertainment and marketing economics in the years to come.Celebrity culture — born in the early movie star sys-tem of the 1910s, fueled by the urban masses — would go well beyond film & Hollywood. For celebrity culture would not only rise in Hollywood and film, but also in radio, sports, and later television, spawning a host of new specialties and cottage industries, from talent agencies to a vast new advertising industry. There is, of course, a lot more detail on the history and rise of the Hollywood star system. But it does appear that “mass appeal stardom” first took hold in the film industry of the 1910s in part through the actions of business-wise film makers and promoters like Carl Laemmle, Adolph Zukor, William Fox, and others. This “movie star” phenomenon was soon spread to the urban masses by the eager newspaper and magazine industries, forming a “celebrity press” that stoked the rise of celebrity and fan culture that followed. Robyn Karney (ed. ), Cinema Year By Year, 1894-2005, London: Dorling Kindersley, Ltd., 2005, p.79. Eileen Bowser, The Transformation of Cinema, 1907-1915 (History of the American Cinema, 2), Berkeley & Los Angeles: University of California Press, May 1994, 337 pp. Karen Ward Mahar, Women Filmmakers in Early Hollywood, John Hopkins University Press, 2006, 332 pp. Kelly R. Brown, Florence Lawrence, The Biograph Girl: America’s First Movie Star, North Carolina, McFarland & Co., 2007, 230 pp.